Last week, kick-boxer and ex-Big Brother housemate Andrew Tate tweeted, "Depression isn't real. You feel sad, you move on. You will always be depressed if your life is depressing. Change it." He went on to tweet other "gems" such as, "There are very few fat lonely man (sic), aged 60 with no money or family or hobbys (sic) who arnt (sic) depressed. 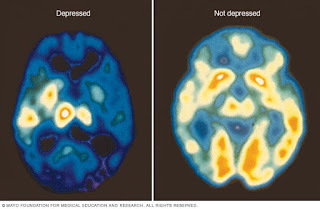 This is not a clinical disease" and "Most 'depressed' people are unhappy with their lives, too lazy to change it. That simple." And with these Tweets, there erupted a gigantic Twitter feud between those who agreed with him and those who vehemently disagreed (you already know which side of the fence I'm on). But, the thing is, there was one thing that made me very disappointed in several people who were arguing against him. Instead of defending mental illness as a real thing (which it is), they were tearing Andrew Tate down, calling him a "c*nt" (a word that always makes me cringe) and even saying things like, "Can Andrew Tate just die" and "I hope Andrew Tate is working us all and is about to actually kill himself." So...let me get this straight. You're responding to someone who doesn't believe in mental illness and suicide by saying that they, themselves, should kill themselves?! How backward is that! It makes the rest of us look bad and, when we say things like that, it only makes Andrew think he's right. But author J.K. Rowling had the PERFECT response to Andrew. She did not use words of malice but words of compassion for those suffering from depression: "This thread will teach you a lot about the defence mechanism of projection, but zero about the real mental illness that is depression. ... Some of the most gifted, successful and gorgeous people I know suffer/have suffered with depression. You are not alone. Have a hug." And just as J.K. Rowling said, if you have depression, you aren't alone. Depression is the leading cause of disability worldwide, according to the World Health Organization, and affects more than 16.1 million American adults. But, apparently Andrew — just ONE man — thinks all of these people are incorrect. Sure, I do believe there are people who confuse their sadness or loneliness for depression. Andrew is obviously making a broad claim about all people with mental illness just because he's met a few people like that. But just because some people claim to have depression who don't, that doesn't mean it isn't an actual disease. Someone may also have Googled their symptoms and was convinced they had brain cancer or something. Just because some people misdiagnose themselves with an illness doesn't mean it's not a very real thing for others. The difference between sadness and depression is that sadness is a normal reaction to life's struggles while clinical depression lasts for two weeks or longer and affects all aspects of everyday life. Depression isn't based on circumstance (although sometimes a circumstance can be trigger it). For instance Linkin Park's Chester Bennington, who lost his life to suicide in July, didn't have a depressing life. Yet he was still depressed. He wasn't a "fat lonely man," as Andrew describes people with depression. He had a wife and six kids. He was the opposite of lonely. In fact, he probably could've used some peace and quiet every once in a while. And he definitely wasn't lazy or struggling. His band just released their seventh album in May, they were planning a tour in the fall and, at the time of Chester's death, he had a net worth of $30 million. So, "no money or family or hobbies" – that didn't really apply to Chester. Yet, despite this, he still had depression. Why? BECAUSE DEPRESSION IS AN ILLNESS YOU CAN'T CONTROL! According to various studies, the hormone cortisol is elevated in the body during times of stress. Typically, when a stressful event has passed, cortisol levels go back to normal. But for someone with depression, these cortisol levels are permanently elevated. Levels of dopamine, a neurotransmitter associated with the "pleasure system" of the brain, are consistently low in depressed patients. It is proven that taking dopamine supplements significantly reduces depression, anxiety and stress-related fatigue in patients. There's a decrease in brain activity of patients with depression, as can be seen by the PET scan released by the Mayo Clinic for Medical Education and Research. When I tell people that I take medication for my anxiety disorder, I will add, "If it wasn't an illness, then why would medication make me feel better?" If mental illness isn't actually an illness, then why do so many people only heal after receiving medical help? For more information and proof on the existence of depression, read this detailed look at the causes of depression, according to Harvard Medical School. I don't know about you, but I'm more likely to believe experts at Harvard University than believe the tweets of a sport star.